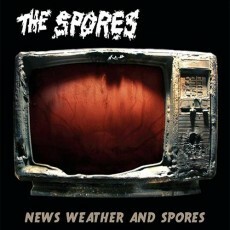 In 1988, during the intense recording of their follow-up album, the Spores were torn apart, leaving only fragments of what would be their best songs. As the years passed and other musical styles rose and fell, these songs percolated in hibernation until recently rediscovered. Now, remixed and digitally enhanced, they form the anthology “NEWS WEATHER and SPORES”, along with other selected anthems from the band’s vinyl years. Many of the songs, like “Shopping Binge” and “Conspiracy in the Sky” have themes which are even more relevant today than when they were written. However, the master recordings of two songs were unfortunately never found, and as an added bonus to the CD, some members of the band reunited decades after to rerecord from scratch these tunes, which appear as the last two tracks. These 20 songs represent the best of the Spore’s output and none have ever been released on CD before. The disc also contains anti-videos for “Up the Boss” and “Meat Biproduct”. Available now on Sudden Death Records.